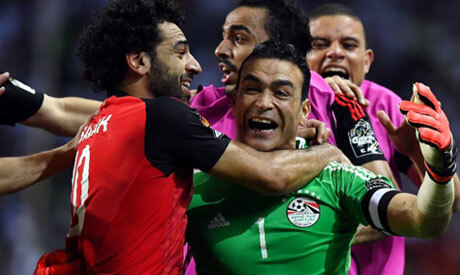 Egypt duo Essam El-Hadary and Mohamed Salah have been included in the CAF's preliminary list for the 2017 African Player of the Year award, while five Egyptian league players compete for the African-based Player of the Year award. "The winner will be decided by votes from the head coaches/technical directors of the National Associations affiliated with the CAF, members of the CAF Technical and Development Committee and a panel of Media Experts," reads a statement published on the CAF's official website on Wednesday. "The Awards Gala will be held on Thursday 4 January 2018 in Accra, Ghana," the CAF added. Taawoun's goalkeeper El-Hadary and Liverpool's Salah were included in a 30-man list drawn up by the African governing body on Wednesday. The duo played instrumental roles in guiding the Pharaohs to ending a 27-year World Cup drought after delivering outstanding performances throughout the African qualifiers for next year's World Cup in Russia. The 25-year-old Salah, who joined Liverpool from Italy's AS Roma in the summer, scored five goals in 10 Premiere league appearances so far this season, while the 44-year-old veteran keeper El-Hadary has appeared in eight league matches in the Saudi league since joining in the summer from Egypt's Wadi Degla. The list also includes Gabon's winger and Borussia Dortmund player Pierre-Emerick Aubameyang, Senegal's winger Sadio Mane, who plays for Liverpool, Ghana's midfielder and Newcastle player Christian Atsu, and Nigeria's winger and Chelsea player Victor Moses. From the Arab countries, the list includes Tunisian defender Ali Maaloul who plays for Egypt's Ahly, Algeria's midfielder and Porto player Yacine Brahimi, Morocco's defensive midfielder and Feyenoord player Karim El-Ahmadi. In the African-based Player of the Year award competition, five players from the Egyptian League were nominated. From Ahly; Tunisia defender Ali Maaloul, striker Junior Ajay of Nigeria and Egypt's winger Ahmed Fathi are nominated, alongside Zamalek midfielder Tarek Hamed and Masry striker Aristide Bance of Burkina Faso.